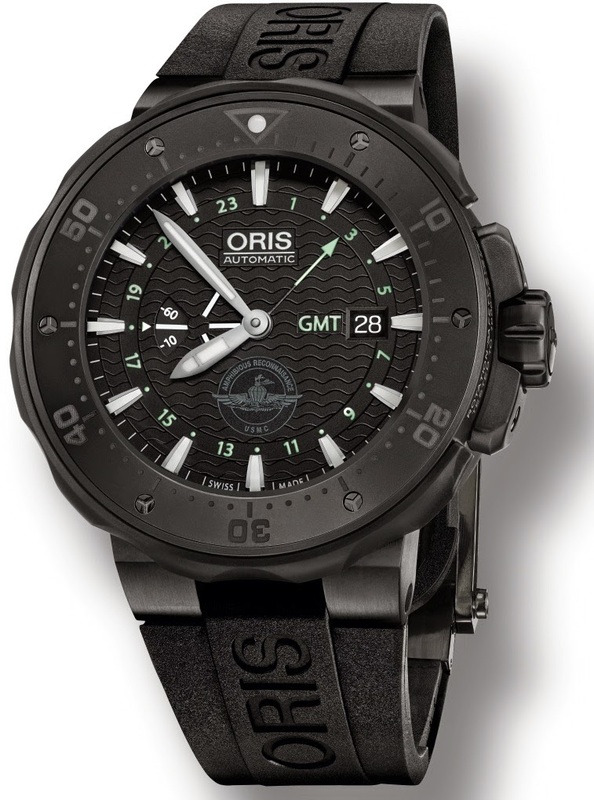 Swiss watch maker Oris has announced a new partnership with the United States Marine Corps Force Reconnaissance, also known as Force Recon, one of the elite US Special Forces companies. Force Recon is a special operations command unit – like the US Navy Seals or Army Special Forces – that operates independently behind enemy lines to provide military intelligence to Marine Air-Ground Task Forces, performing deep reconnaissance and direct action missions at sea and on land. For Force Recon, Oris has created a high-performance, state-of the-art wristwatch designed to meet the unit’s demanding equipment standards. The Oris Force Recon GMT is based on Oris’s innovative ProDiver, the diver’s watch renowned for its Oris-developed Rotation Safety System, which locks the bezel into place according to the wearer’s requirements. This special watch has a new Oris GMT movement, giving it a second time zone, indicated via a central hand and a 24-hour scale around the dial. It also has an innovative small seconds display at 9 o’clock, designed to show the wearer the watch is working in low-light conditions, a useful device when ‘going dark’. The 49mm case is made of titanium and treated with a tough black DLC coating, while the unidirectional rotating bezel inlay is made of scratch-resistant matt black ceramic. The watch comes on a black rubber strap, with a black NATO fabric strap option included in the presentation case. The rubber strap features Oris’s pioneering quick-adjustment sliding sledge folding clasp, which can be adjusted while the watch is being worn. Protection and cover is offered by a ‘tactical watch cover’ – a mask with a retractable top section that wraps around the watch. 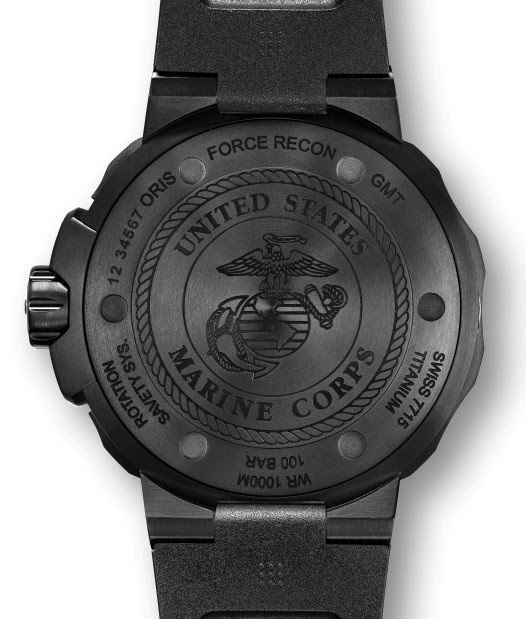 The dial carries the Force Recon emblem, which is also engraved on the case back. The watch comes in a black water resistant case, and will be delivered in June 2015.